Don't you just love good books? We have a sweet friend who gifted Lily the most beautiful book. I am totally in love with the Mary Frances collection. 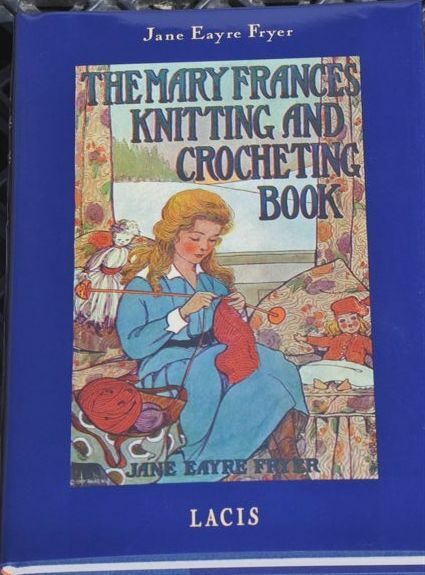 They were written in 1918 by Jane Eayre Fryer, who was a pastor's wife. Her style of writing is captivating as she teaches basic skills such as gardening, first aid, sewing, crocheting, cooking, and other dear subjects. Lily and I are going to slowly acquire the whole collection and read them as we go. Your daughter can learn to crochet a little dolly sweater. Or, a doll's crocheted book bag. Aren't those some of the sweetest projects ever? There is a whole collection of books. You can even purchase the Mary Frances doll. There are little printed patterns in the back for clothes that you can sew for her. I am so glad we were introduced to the series and hope that these are a treasure to Lily as she grows! Our oldest daughter has 3 of these beautiful books. So quaint and lovely. Oh wow, I've never heard of these...I love the illustrations on the front...going to check them out right now. THANKS!